On the eve of our battle, I began to question our mission. Morale was low as the enemy’s plan came to fruition. We were beaten down, nearly out of commission. When he appeared, the leader of our Inquisition. He stood in front of us, tall and broad. We held onto his words, stood and felt awed. The Inquisitor, the leader of our squad. He looked up at the sky and began to preach. He spoke of the Mage and Templar conclave. With the Divine in danger, he tried to save. Her life before she became a blood slave. But he was too late, she went to her grave. He spoke of walking, fighting in the Fade. Where a demon died, and a warrior was made. But on his heart, a heavy choice weighed. A friend was left behind so he could be saved. He said the enemy had an orb of immense power. Clad in armour, he rose like a metal tower. We all drew our swords and thrust them into the air! We let out our rallying cry, with all the breath we could spare! We were prepared to go into battle and give it our all. For on the dawn’s light an ancient god would finally fall. Reading this, my mind flashed back to reading other "story songs" from books like "The Hobbit" and the "Lord of the Rings" trilogy and the various chronicles of Thomas Covenant. It's amazing how well the language conveys a sense of history and lands long ago, imagined or real. 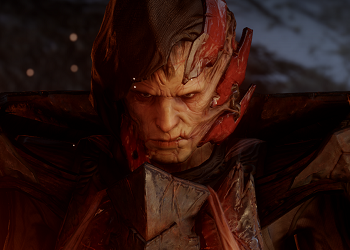 Of the Inquisitor, the leader of our squad. Hope you do get around to making some music for this, even if it's just an instrumental piece to serve as background while the song is recited. When I was writing this, I was hearing a celtic folk song in my head. I'd love to be able to put music to it but the only software I have is Garageband and I can't for the life of me figure out how to use it.